It's time for that million dollar question...What are we going to make out of two boring shirts today? This question is second to none only behind "what weird thing can we hoop today" and "I wonder if you can thread this thing while it's running." The answer to the second one is no, by the way, regardless of how much coffee you've had. "Boring" might be a bit of a harsh word to describe these shirts, they do have something quite valuable. Something we're going to take advantage of today... sleeves! You see, we had fun making a drape vest from scratch earlier this year, but the key factor in making that a simple tutorial was the whole vests-don't-have-sleeves thing. Sleeves are finicky and fickle, but sadly the cold weather has come and light vests without sleeves just don't cut it. Unless you're one of those midwesterners in denial, out for a walk in a winter parka and shorts. You know who you are. So, we're going to use the sleeves from one of these shirts, but upcycle them into a much more awesome creation... a winged drape cardigan. 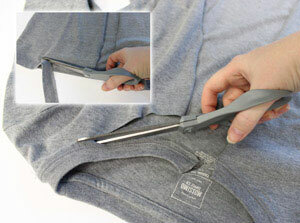 Making your cardigan seriously couldn't be easier. By utilizing sleeve theft of a perfectly long sleeved garment, all that's left is to turn it into a draping embroidered masterpiece. 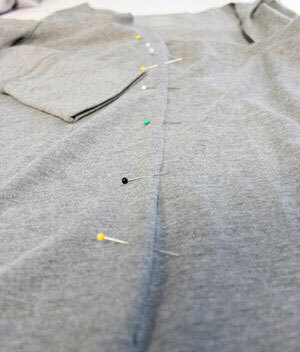 If you can cut and sew things in a straight line, you're set. If you can't, you should really put that glass of wine down and come back to this later. Two shirts, at least one with long sleeves. The one with sleeves should be a size that fits your arms comfortably. The two can be matching, but it doesn't really matter. The whole color blocking thing is in this year, so you could probably get away with it. 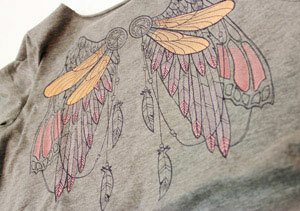 A flippin' awesome embroidery design, like these wings, for the back. 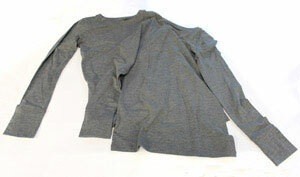 Keep it light unless you're making this out of a heavy sweater or something similar. 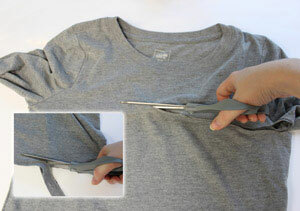 Grab your long sleeve shirt (or one of them anyway) and start by cutting it up the middle. 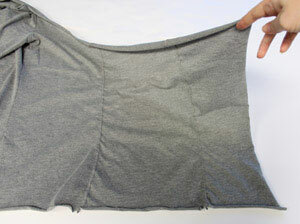 You can also remove the trim around the collar, and the bottom hem. Now you have... a really lazy cardigan! You could pop this on now and call it good, but the crafting gods would frown and possibly smite you. Instead, we'll want to prep it for it's drapeyness. If you remember from the vest tutorial, those fancy draping vests are nothing but a rectangle that extends out from the cardigan. To make your shirt ready for that, we're going to need to drop the neckline. 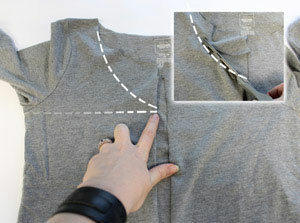 Draw an invisible line from the underarm of your shirt to the center. This is how far your neckline needs to go down. Mark a gentle curve upwards to meet the shoulder neckline, and cut that excess off, like shown. 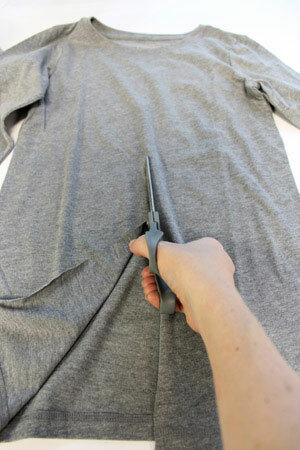 We need to do this because the only usable part on your other shirt is everything below that sleeve line. 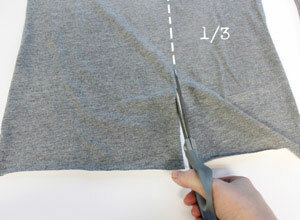 Grab your scissors, and cut that second shirt all the way across, just under the sleeves. You can cut the bottom hem off that shirt too. 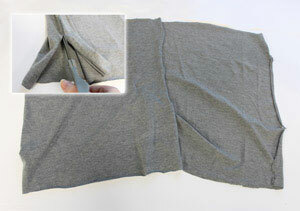 Next, cut up both sides of your shirt, along the seams. You should now have two rectangles of fabric. These are going to be the extensions we'll add to make our cardigan drape. Because there's going to be a natural and unavoidable seam line as we add this section, I say we make it look intentional. The best way to hide stuff is in plain sight, and the best way to get away with stuff is to act like you know what you're doing. What do you think I'm doing here? To be honest, the raw handmade look is so in these days you'd pay a mint to get that look on a store bought item. So, instead of just attaching this piece in one large chunk, I'm going to do it in cascading pieces with raw open edge seams. If you want this look, snip off about 1/3 of your shirt rectangle off. 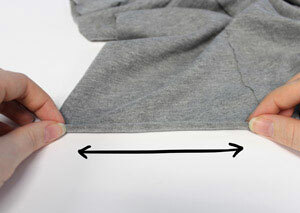 On the one side of your cardigan, take the larger chunk of fabric you just cut (the 2/3 size) and pin it in place along the raw edge left from cutting it up the middle. I let one piece overlap the other by about 1/4" inch. Starting from the bottom, pin it in place carefully, because knit sometimes gets it in its head to make a break for it while you're working. That's not the kind of workplace we condone around here, so pins it is. Once you've pinned this side in place, you might notice you have a little bit of excess collar at the top. This might be a freak of nature or it might be the fact that I hate actually measuring anything. No worries, just cut that side down until it meets the extension at a nice smooth angle. Improv is the name of the game here, as I model my crafting technique mostly after MacGyver. 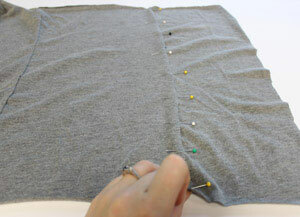 Once everything is pinned in place, sew a seam down the side. Since I was going with the idea that these seams are just part of the look, I added to some of the fun by using a contrasting orange thread. Which would look fun if you could actually see it in the photo. You'll just have to trust me on the fun-ness. I wouldn't lie about a thing like that. Once that seam is done, you can attach that last little 1/3 bit you snipped off. Yes, I realize by doing that we added an extra step. Well, fashion is pain, people. And by pain I mean a minor 3 minute inconvenience in the name of style. Quit whining. 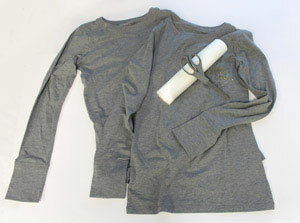 Oh, want to know something extra neat about these stretchy T-shirt knits? 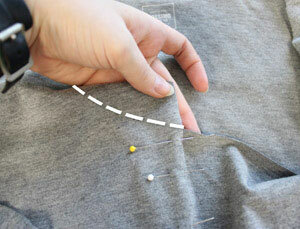 You can give yourself a "finished seam", so to speak, by tugging the edges of your fabric apart, like so. The raw edge with curl in on itself, giving you a neat, semi-finished edge with little effort. Cool, huh? Here's one of our cardigan edges all finished. But wait, you're not done yet! Unless you're into really high end fashion, it's best not to toy with the eccentricities of asymmetrical cardigans. Repeat your steps on the other side. And of course because you knew it was coming, we have to add some awesome embroidery to the back. I picked our "Spirited Wings" design because it makes quite an impact but is still light stitching enough for stretchy knits. 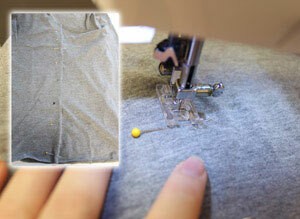 Hoop up your shirt with your no-show or mesh cutaway stabilizer, and stitch one wing at a time. Want tips for perfect wing placement? Check out this tutorial. Once your wings are done, carefully trim away the excess stabilizer on the back. That's it! Your humdrum shirts just transformed themselves into something fabulous. Who would have thought you could get such a cool look by cutting something in half and stitching a long rectangle to it? Yup, I'm a big advocate of great looking but deceptively lazy DIY fashion. No finished seams, no measuring, just straight lines and embroidery. Your raw edges and contrasting seams look right in place on your bohemian style drape, and because it's a T-shirt knit, nothing will fray. 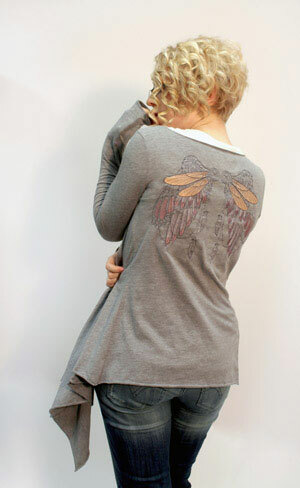 It's fab and flowy and it is such a great place to showcase those wings. It's also a great way to rock a look that is flattering to your curves and killer on style. 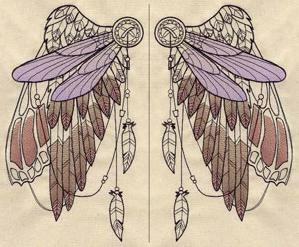 Throw it over a tee or tank for a look so effortlessly airy, you could just float away.